JP (Download) 2009-12-16 ¥? ? 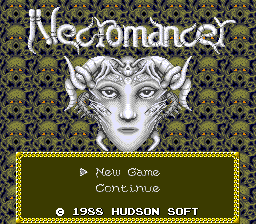 Jaseiken Necromancer (邪聖剣ネクロマンサー), sometimes known simply as Necromancer (though unrelated to a different Necromancer, released for Atari 8-bit computers and the Commodore 64 in 1983) is an RPG released for the PC Engine in early 1988. Main article: Jaseiken Necromancer/Magazine articles. This page was last modified on 23 December 2018, at 06:55.